Access to locale specific calendar systems. Add an amount to a field. nCalendarFieldIndex One of CalendarFieldIndex values. nAmount The amount to add. Returns all available calendars for the given locale. Get the UTC date/time as an offset to the start of the calendar at 1-Jan-1970 00:00. The integer part represents the number of days passed since start date. The fractional part represents fractions of a day, thus 0.5 means 12 hours. returns a sequence of CalendarItem describing the day names. Returns a string (name to display) matching the given parameters. 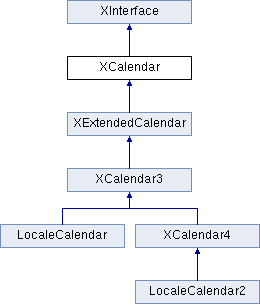 The value should be obtained by a previous call to XCalendar::getValue() with an appropriate CalendarFieldIndex argument. nNameType A value indicating whether to return the abbreviated or the full name, or the narrow name for some CalendarDisplayIndex values. returns the first day of a week, one of Weekdays values. Get the currently loaded Calendar. returns how many days of a week must reside in the first week of a year. returns a sequence of CalendarItem describing the month names. Returns the ID string of the loaded calendar, for example, "Gregorian"
Verify if the date fields set by a combination of XCalendar::setValue() calls is valid. Load a specific calendar for the given locale. Load the default calendar for the given locale. Set the UTC date/time as an offset to the start of the calendar at 1-Jan-1970 00:00. Set the first day of a week, one of Weekdays values. Set how many days of a week must reside in the first week of a year. nValue A value of the allowed range for the field index.